Starting GPS Co-ordinates: N50 84' 10" E000 20' 00"
Finishing GPS Co-ordinates: N50 83' 90" E000 18' 60"
To see: the entire South Downs with all their history, Arlington Reservoir, Michelham Priory. N.B., this lane is subject to a TRO between 1st October and 31st March every year. Do not attempt to drive it between these dates. It really is this green! Hayreed Lane is an awesome little BOAT that lies just west of the town of Hailsham. There are two starting points (see map, below): the northern one is at TQ550070, the eastern at TQ551064. We drove it from the north. At the northern end, and also about halfway along its length, there are metal gates which are left unlocked. These are a bit of a squeeze so take it carefully, and close them once you've passed through. Consisting of a gravel surface with some weeds beginning to poke through, interspersed with earthen sections, which is conveniently also the exact width of a Land Rover's footprint, the lane is nice and wide even if the actual track is not! It's a very easy going and exceedingly pleasant lane to drive, and when the foliage breaks it offers some incredible views of the South Downs. 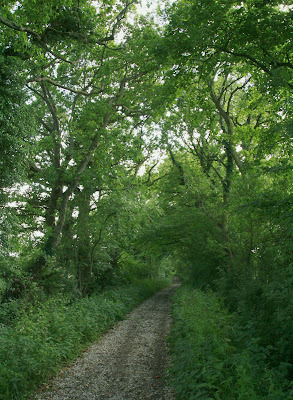 Whilst talking about foliage, however, one short section of the lane, just before it reaches its terminus, is a little overgrown and could do with some clearance. At around a third of its total length, the lane turns sharply to the east where it merges with the previously mentioned alternate starting point, and then works its way on a dog-leg route to the finish on The Street, just south of the village of Arlington. The only downside is that it simply is not long enough. We almost wanted it to go on forever! It scores a 5 despite its length. Whilst here, you could walk the circumference of Arlington Reservoir, picnic in the grounds of the ancient Michelham Priory, or go tumulus and barrow spotting on the South Downs. YES this is post number 102!! !